The dining room was the first room in the apartment to be reasonably done. I had the dining set, the painted walls, and a few decorations. Since the other rooms were in need of a little more attention, I neglected the dining room in order to make the rest of the house presentable. Now I figure it's time to show the ignored room a little more love. 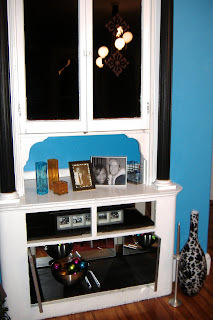 The china cabinet is the biggest project (and eyesore) in the room. We use the cabinet to store books and games. This isn't exactly what I wanted showing through the glass when I'm entertaining in the dining room, so I made a plan to cover the glass doors. 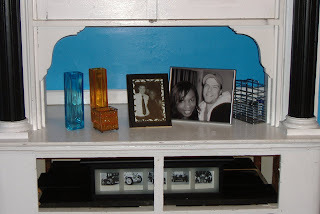 At first I was going to use decorative papers or fabric. The fact that I couldn't get a nail through the frame of the door stopped those plans. Not caring enough to try the staple gun, I gave up and decided to spray paint the doors instead. If you're looking to jazz up your china cabinet doors, or any other glass/mirror surface, there are several different kinds of glass paints you can buy from your local craft store, including stained glass kits. While at Michael's, I found mirrored glass paint. Wanting to add a little silver sparkle to the cabinet, I thought this would be a great way to hide the storage area. Of course, the promise of a paint that turns glass into a mirror turned out to be too good to be true. 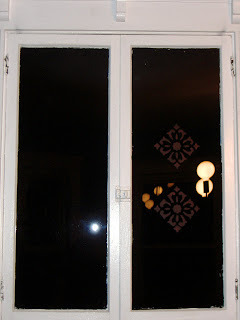 Though in some areas the glass took on mirror-like qualities, most of the door looked horrible due to spotting and dripping. Mirror paint dries instantly and leaves no room for you to smooth out drips. Though I had no success with this project, it might still be worth trying if you are able to lay your glass down flat to prevent drips (my cabinet doors don't come off). Since the mirror paint didn't work, I got out a can of good old black spray paint and quickly sprayed the door black. Instant coverage. For fun, and to bring out the red accents of the room, I added a red stencil to the doors. I'm not a big fan of this and will be taking the red off to add a white and silver design that will match the black and white vase sitting by the china cabinet. Next is the middle of the cabinet. Ignore all of the decorations sitting on the buffet area...I'm building storage below for all of the extra decor I have laying around but until then, it all needs some place to go! To start off, I painted the inside wall blue. This looked cool at first, but after painting the pillars and glass black, I've decided to do the same with the back wall. I'm thinking of painting the whole cabinet black and leaving the pillars white but we'll save that task for another day! The bottom of the cabinet is being made into a faux fireplace. The prevoius tenants thought it would be a great idea to take the doors and drawes with them (why I don't know) so we're left with these hideous empty spaces. To achieve the look I'm going for, I'm going to remove the Tbar that divides the space. It offers no support and I really have no use for the top portion. Using wood and the $5 mirrored doors I got from Ikea the other day, I'll mirror the back so that when I light candles below, they glow and bounce off the mirrors. I'll then use the wood to cover the sides.